The picturesque village of Vianden, situated on the banks of the Our River and guarded by a magnificent restored medieval castle, makes a pleasant day trip as it is conveniently only 25 miles (40km) north of the city of Luxembourg. The castle dates back to the 9th century and was originally the home of the counts of Vianden, powerful nobles until the 13th century. The ruined castle was restored in the 1980s and now houses a museum that recaptures life in the Middle Ages and recounts the area's troubled history. In the small town below, visitors can sip tangy Moselle wines beside the stream while enjoying the views of the green hills. The village has been delighting tourists for more than a century, and strolling around the narrow cobbled streets beneath towers and medieval ramparts feels like stepping back through time. 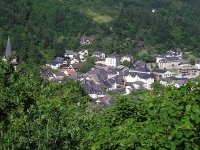 The surroundings of the town are magnificent and there are many pretty walking trails to be explored using Vianden as a base. Indian Forest also offers fun and thrilling high rope and zip-line courses for the whole family, which allow visitors to traverse the forest canopies. There is plenty of quality accommodation and some lovely restaurants to enjoy in town.